I first came across Portia de Rossi in Arrested Development, and then again in Better Off Ted. In both shows, I thought her mannerisms a bit odd at first, but in both shows she grew on me, and in Better Off Ted, she became (after Phil, and I mean, come on) far and away my favourite character. And this makes sense because in person (and on paper) she appears funny and smart. 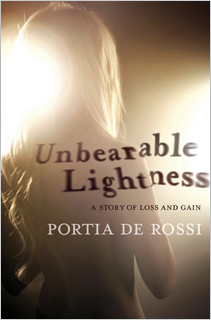 Of course, in her memoir Unbearable Lightness, her sense of humour only indirectly reveals itself in her recounts of conversations with suits, because anorexia is not a funny illness, and I imagine that no matter how far she has come since 1999, it’s still difficult to treat such a dark part of her life lightly. De Rossi writes clearly, honestly, and bluntly – there are no histrionics or flowery, colourful passages depicting her descent into despair. Instead, she recounts her experience in a very matter-of-fact way: it’s “this is what happened, this is how I felt, this is what I did.” It is therefore incredibly easy to sympathise because she’s not asking for your sympathy, she’s just putting you inside her head at a point in her life, telling you what it was like for her. Like many anorexia memoirs, Lightness is clinical, with detached lists of measurements and rituals. The progression of the disease is similar (grossly simplified, it starts off as the desire to be perfect and achieve, becomes desire to be thin as possible as a means of controlling this, and ends up not even being about what you look like, and simply continuing the lifestyle out of habit and familiarity, because you’re afraid to live any other way), as is the initial (and lengthy) denial of the problem, the concern of family members, the slow realisation of the problem, and the long road towards recovery. I would like to point out two things that I think de Rossi did particularly well, however. One is the way she shows how mental illness sneaks up on you, and the heartbreaking way in which big, meaningful, life changing moments seem to happen over and over again; a realisation hits, you’re filled with a sense of purpose and direction, you think it’s cured and you’re all better, and then it’s more of the same – stuck in an endless loop. De Rossi is incredibly good at portraying that hope/hopeless dichotomy simply and harshly. The other is the mature handling of her relationship with her mother – she tells the story from the point-of-view of one who has recovered, but while relating the events, she reports her thoughts as she would have thought them back then, without passing judgement or qualifying how wrong those statements might seem to her now. So when she speaks in tones of resentment about her mother, it is clear that this is the Portia of the past talking, and whatever faults her mother may have, she is a fully realised, sympathetic person in this book. Dealing with a difficult situation that doesn’t have a prescribed set of socially acceptable and expected reactions (namely, a gay and severely anorexic daughter – one may want very much to be supportive, while dealing with one’s own issues, and not know quite how to do it), and I can’t imagine she would be disappointed by her portrayal in this book. In short, Unbearable Lightness was intelligent, thoughtful, and easy to read, and I have a new respect for the actress who made me laugh so much as Veronica and Lindsay Bluth. And, as a random and possibly tasteless side note, I wonder if it was purposeful that the cover was designed by “Meat and Potatoes Inc.” I mean, really.